Scathing attacks on CNN's Unverified coverage of Iranian riots following the elections. I just changed my photo to green and my location to Tehran...does that make me a reporter on the ground. I get the impression BBC Persian service is doing a much better job, but I am also surprised that BBC World News is not making much use of those fantastic Google-earth type maps that I know they have. You want the overview? Then you need something better than broadcast media. View more Microsoft Word documents from vcobserver. I met Salim a few years back at Newsxchange in Amsterdam. He was trying to start a pan-African TV channel from his base in Nairobi, Kenya. Salim is a passionate media professional. He's the son of Mohamed "Mo" Amin who was a Kenyan photojournalist noted for his pictures and videotapes of Ethiopian famine. Apart from Ethiopian famine, Mo contributed exclusive photos of the fall of Idi Amin and of Mengistu Haile Mariam, and was author of numerous books, including Journey Through Pakistan, and covered various themes like East African Wildlife and the Uganda Railway. Amin died when his Ethiopian Airlines Flight 961 on November 23, 1996 was hijacked and he tried to rally passengers to overpower them. Salim is taking his father's memory further, not only finding ways to take the collection further, but also create a platform for other African journalists. In this interview, made at the 2009 Global Media Forum at the Deutsche Welle Bonn last week, Salim updates us on the current plans, explains why a lot of journalist training in Africa fails, and his vision for content on mobile phones. He's suspended the idea of a 24hr channel, and is currently concentrating on building a African Media Agency. Salim Amin A24media.com from Jonathan Marks on Vimeo. I have just come back from Germany where I think public service broadcasting has gone into a tailspin this week. ARD and ZDF seem to have capitulated on calls by politicians and commercial interests to scrap a lot of the work they do on-line. The Berlin Wall came down nearly 20 years ago. This year a firewall of silence is being raised in Germany - which can have grave consequences for investigative journalism and feature making. I was struck by the entry and comments on this page from the Radio Netherlands Media Network site. I've cut and paste the following from there. Germany’s public broadcasters will drastically reduce the programming they put online in response to attacks from commercial channels and newspapers that the online offerings represent unfair competition. Markus Schachter, director of public broadcaster ZDF, said the channel will reduce its online offerings by 80 percent and cut the length of time that catch-up programing is available for streaming. Reports on the official websites of ZDF and sister channel ARD will now be taken down after one week, and reports on sporting events, such as Germany’s Bundesliga soccer games, will be pulled after only one day online. Schachter also said ZDF would focus more on posting video to its site and greatly reduce its text-only offerings. The move is a sop to the German newspaper industry, which has complained that ARD and ZDF’s free websites unfairly compete with the online versions of their publications. Readers added: It’s not like the German public broadcasters had given in voluntarily. Twelve months ago, EU commissioner for information society and media Viviane Reding had complained about the public broadcasters’ web offerings, citing EU regulations. She appealed to Germany that they should set limits to their public broadcasters on what kind of online content is acceptable, and the German states (Bundesländer) followed suit in their new state treaty on broadcast services and telecommunication media (Rundfunkstaatsvertrag). ARD and ZDF really tried to defend themselves. For example, they argued that their fee payers had funded their productions and should have the right to continuously access it. But in the end they had to cave in. I guess some politicians aren’t too unhappy that all the critical reports from political TV magazines will now vanish after one week. The matter is even more complicated. Any online activities beyond making broadcast content available for seven days (equivalent to BBC iPlayer, considered as broadcast distribution, not as real online service) requires a procedure that is basically a copy of the “public value test” for the BBC. So it remains to be seen what will be the outcome of these public value tests. However, ZDF indeed choose to eliminate 80 percent (that’s the figure quoted in Germany) of its online content and not submitting it for the public value test at all. Also related to this matter is the closure of two WDR radio channels, presumably prompted by the circumstance that it was no longer possible to run more radio stations than authorized*) by way of distributing them online only. Thus WDR 2 Klassik and 1 Live Kunst have been eliminated. The latter was on digital broadcasting platforms (including DVB-S via Astra 1H) as well, and it has been replaced by Kiraka here, a previous online-only channel with repeats of childrens programmes from WDR 5. Those reader comments are spot on. I wonder how the German public will repond? I feel the public broadcasters have been rather weak in their argumentation. Look at the image campaign like this one which outlines what rights you have to be informed. It doesn't explain that all this is severely compromised by what the politicians have decided to do now. I am usually critical of the academic world for writing about the past rather than helping to map out the future. But a conference at the start of October in London looks like it has antipcated this move. The Communication and Media Research Institute (CAMRI), University of Westminster, and the European Communication Research and Education Association (ECREA) are organising a discussion on Media policy responses to the private sector recession in Europe on October 2nd. More details of the conference here. No connection with the organisers, by the way. Labels: ARD ZDF "Public Service Media"
The Onion News Network continues to poke huge holes in the broadcast news industry. They are so slickly produced, they're way ahead of the skits produced for David Letterman, etc. Reboot11 is happening in Copenhagen again this year. It is an off-beat mix of great minds over two days in the Danish capital. This year seems to be a bit more chaotic than usual - perhaps it is a sign of the state the industry is in. But I get the impression it will turn out fine in the end. The videos from last year are up on the website (embedding seems to be problematic I have found) but they do give a flavour of what's to come. 450 have signed up so far. The dates are Thursday June 25th and Friday June 26th 2009. If you're planning to attend, give me a shout. Sitting in the DW Global Media Forum, I realise I am not really using a camera. This guy has a camera. And a really serious lens. OK, so you can't read this blog in China now with tags like Tiananmen and June 4th 1989. But that doesn't stop me recalling the very dramatic broadcast from the English service of Radio Beijing as it was then (now China Radio International). The announcer called on all listeners to recall the events of the evening of June 3rd 1989 in Tianamen Square. At the time we believed the announcement to have been made by Li Dan, a producer in the English department. A full transcript is here. Just look at Footnote 47. I haven't (yet) managed to find the Media Network broadcast a few days after. But in April 1992 I made a Media Network special feature (with help from the Asian Broadcasting Institute of Japan) which looked at what happened in the propaganda war between China and Taiwan immediately afterwards. Want to hear it? Then download the MP3 file of the programme segment here. It's 27 MB. 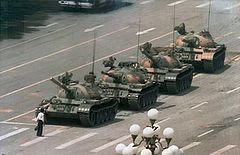 I note the BBC World Service has been putting out documentaries out about Tiananmen, although they have been broadcast well before the anniversary. May be it is a clever tactic to get around the great firewall just before the blocade intensifies? Many reports out there of heightened censorship this week. Kate Adie, one of the BBC correspondents in Beijing at the time, wrote an interesting account in the UK Daily Mail newspaper. Labels: "China Radio International""Radio Beijing""Tiananmen Square" "June 4th"
Hans Rosling is at it again with fascinating stories on statistics. Check it out.